Honolulu deaths in March, 1886. The deaths in the district of Honolulu nei for this past month of March, were: 32 Hawaiians, 5 Chinese, 2 Americans, 2 British, and 3 other peoples, totaling 44. Ko Hawaii Paeaina, Buke IX, Helu 14, Aoao 2. Aperila 3, 1866. Obituaries and Vital Statistics, 1835. Nov. 26. William Moxley of Ewa. Dec. 25. Davida Tamehameha died in Honolulu. He was seven years old. Dec. 16. Died in Honolulu was Olohana (Mr. John Young), he was a very old haole; he was ninety-three years old and lived in this archipelago for 46 years. At Waialua these four months. The people who died and were born in Kahuku these three months. Ke Kumu Hawaii, Buke 1, Pepa 26, Aoao 207. Dekemaba 23, 1835. Statistics galore and useful information, 1875–1947. 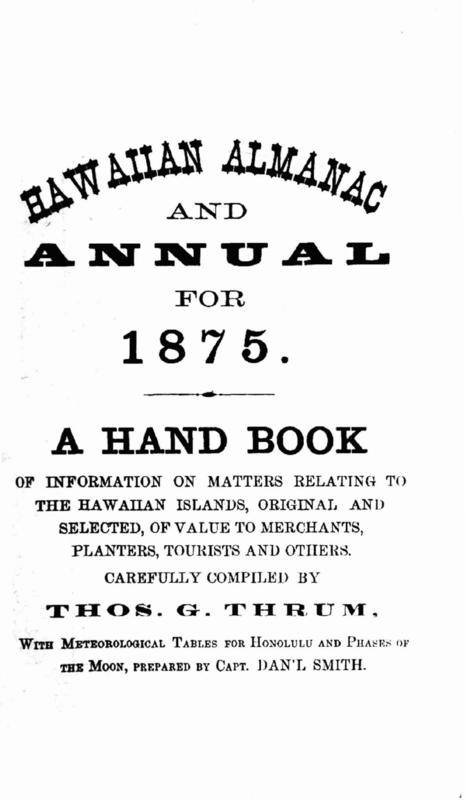 If you haven’t heard of Thrum’s Hawaiian Almanac and Annual, check this out! And if you didn’t know that it is available online, here it is. This long running yearly publication contains a wide range of general information all in one place, and it can come in handy. Mahalo to the good folks at Hamilton Library’s Hawaiian Collection (5th floor) for putting up this helpful page! 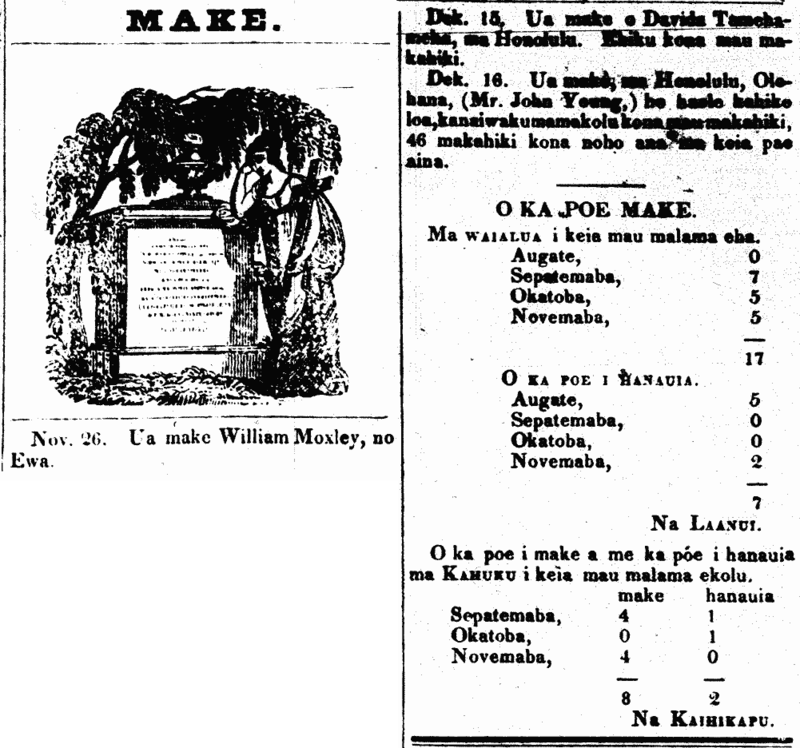 First page of the first “Hawaiian Almanac and Annual”.